The Dillon Quick Balance tension meter quickly measures tension on lift traction cables or other cable sets, recording individual readings, averages and total readings. 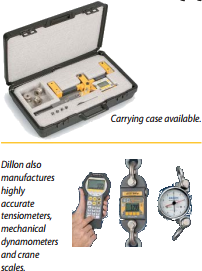 Quick Balance installs, measures and removes in seconds, giving accurate digital readings up to 10,000 lbs. No lookup or correction tables required, and no need to write down readings for comparisons. Quick Balance can be placed on a cable, measure its tension and removed in seconds! There are no complex lookup tables and no conversion charts. The operator can quickly select from dierent wire rope sizes and types stored in the Quick Balance memory. Once a set of measurements has been taken the operator can adjust various tensions in the check tensioning mode which displays both current and target settings of individual cables. 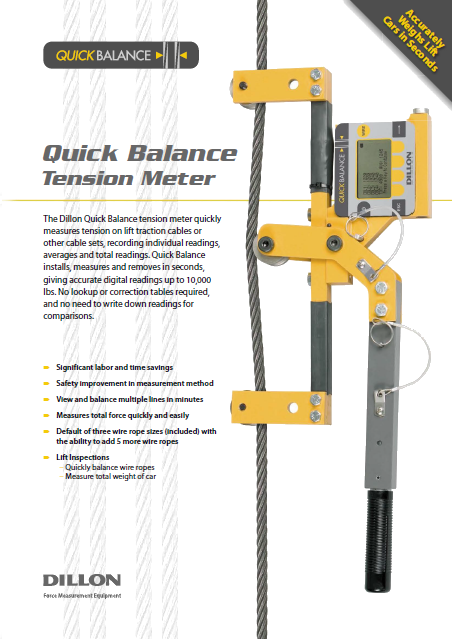 The Quick-Check can be employed in many industries to ensure proper tensioning. Typical applications include tower and stack guy wires, pretensioned cable barriers, bridges, elevators, winch rope, overhead electric transit wires, fall arrest systems, aircraft cables and utilities. Sheave range: Set accommodates rated wire size and ½” smaller. Multiple sheave sets may be used. Suggested wire calibrations: Calibrate each wire diameter needed with the most appropriate sheaves. If two wire types are used of the same diameter (e.g. ½” 1×7 and ½” 6×19), calibrate each type independently if accuracy is critical. Environment protection: Suitable for continued outdoors use.